This is a Spanish soup dish composed of meats such as ox feet, salt pork, chorizo de bilbao and vegetables like potatoes, cabbage, white beans, olives and of course onion and garlic. If you are not familiar with salt pork as I am, it is a salt-cured pork and usually prepared from one of three primal cuts: pork side, pork belly, or fatback. Unlike bacon, salt pork is not smoked, but rather is cured by being packed with salt. 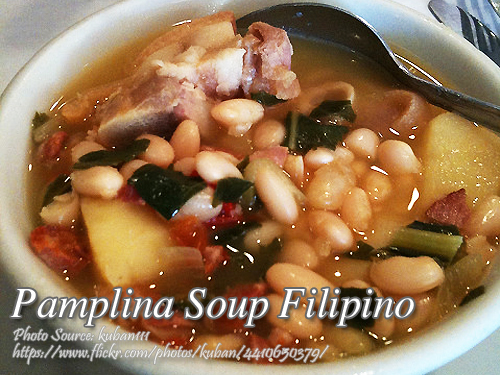 To cook pamplina soup; Clean beef pata and put in a pot with the bay leaf. Simmer till tender, about 4 hours. Remove skin and tendons from bones and cube. Set aside the broth. Boil salt pork and cube. Put beans in a pot, with water to cover. Simmer till tender, about 2 hours. Heat olive oil in a casserole. Saute garlic, onions, chorizo and potatoes. Add broth from the pata. Add pata, salt pork, cabbage. Simmer till the soup thickens. Season with salt and pepper. Clean beef pata and put in a pot with the bay leaf. Simmer till tender, about 4 hours. Remove skin and tendons from bones and cube. Set aside the broth. Boil salt pork and cube. Put beans in a pot, with water to cover. Simmer till tender, about 2 hours. Heat olive oil in a casserole. Saute garlic, onions, chorizo and potatoes. Add broth from the pata. Add pata, salt pork, cabbage. Simmer till the soup thickens. Season with salt and pepper.